Working remotely from home is becoming more popular now that most work and communication is done digitally. That means that many entrepreneurs and small business owners use their local coffee shop as their favorite office space away from home. If you count yourself among the growing number of coffee shop workers, then know you are in good company. However, there are certain unspoken rules of coffee shop etiquette that should be followed to avoid offending your fellow workers or the owner of the coffee shop itself. Because these rules are largely unspoken, they are often violated by those who are new to the coffee shop scene or those that are just not aware that some etiquette rules do apply in this type of locale. In order to help all of us, it may be time to give some tips on proper guidelines when using your favorite coffee shop as a meeting place or as another remote office location. #1 Always make a purchase. The coffee shop is a business and a $2.00 cup of coffee for 6 hours of free workspace and WIFI is not going to make you popular. Be supportive of your fellow business person and purchase their products. As I have mentioned in other posts, if you are willing to help other businesses then eventually other businesses will help you. It’s a win-win. #2 Give the coffee shop a shout out on social media. Another great way to support your favorite coffee shop is on social media. #3 Take the smallest size table for your needs. If it is only going to be you and one other person, don’t occupy a 4-seat table just to have more room to spread out. Tables are always in short supply at coffee shops so be considerate and leave the larger tables for larger parties. #4 Don’t hog the electrical outlet. If you don’t need an electrical outlet, choose an open seat that isn’t near one. However, if you find yourself with an outlet, be considerate and let those nearby know that they are welcome to use it if they need to charge their laptop or phone. An even better idea is to carry a power strip with you and win friends. Sharing a power strip is also an easy way to do some networking with your fellow coffee shop patrons. #5 Keep the noise level down. Many people use coffee shops to work where they won’t be interrupted by pets, children, or co-workers, so be sure that you are promoting that environment for others. A coffee shop is not the place to take calls via speakerphone or to watch webinars or videos without a headset or earbuds. You should also be aware of your voice level when talking on the phone or with someone in person. Speak loud enough for the other person to hear you, but not so loud that everyone can hear your entire conversation. #6 Clean up after yourself. Make sure to leave your space clean when you leave. Be sure to pick up all your trash and dispose of it on the way out. This will help other patrons looking for a seat as well as the coffee shop. If you follow these six simple rules, you will make your coffee shop office a better place for you, those around you, and the business itself. You may also make some valuable connections and make a fan of the coffee shop employees and owner. And who doesn’t need more fans? What other tips do you want to share for those who work at coffee shops? Please share in the comments below. 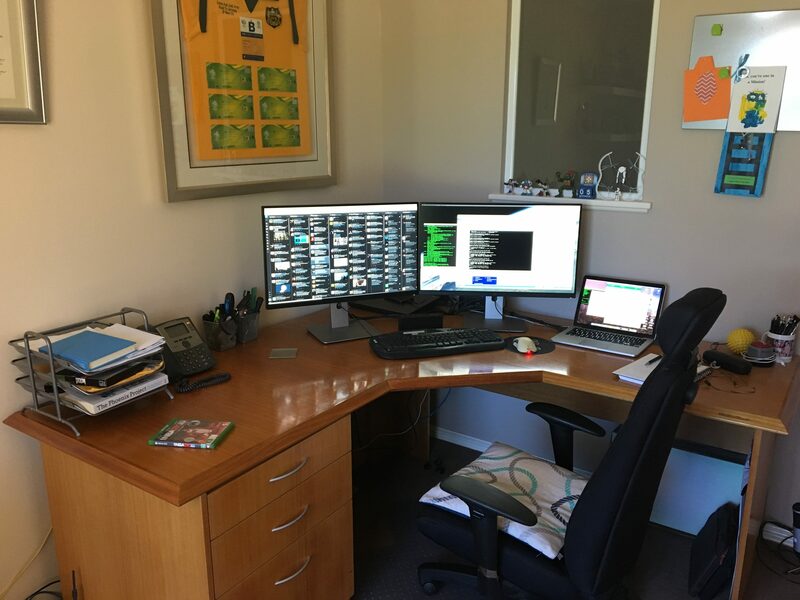 What I’ve Learnt from 12 Months Working From Home – VIRTUALIZATION IS LIFE! This week marks one year since I started at Veeam and it feels like that twelve months has flown by. Before I started here at Veeam I had only worked for local companies here in Perth, though the last two had national presence which meant some travel interstate and occasionally overseas for events like VMworld. Prior to this role I was office bound however this role, being part of a Global Team meant that I had to work remotely from home. Something that I thought would be a walk in park…however the reality of working from home is far from that. There is a growing norm (especially in IT) where location doesn’t matter and working remotely is embraced. For the employer they win by getting the person they want…and for the employee the boundaries of locality are lessoned meaning that more opportunities can be pursued. In my case, living in one of the most isolated cities in the world I was aware of other vendor roles where people worked from home so knew if the right role popped up, I had a chance to remain in Perth…travel a lot…and work from home. The role that I’m in has me traveling roughly once every three days, however that has come in waves and I’ll have periods of travel, followed by periods at home meaning I could have times where i’m working from home for weeks on end. While this isn’t a definitive guide as such to working from home, I wanted to jot down some experiences and lessons learnt from my last 12 months, because the adjustment was tougher than expected. If you want some generic advice there are lots of articles out there that list the Top Working from Home Tips, but below are my key takeaways from my experiences. This is the obvious one, however it’s actually hard to achieve unless you really put your mind to it. Over the first two to three months I was finding myself still stuck int the old routine of getting up and effectively going to work. I sat in front of the computer from 8am to 5pm, had dinner, played with the kids and had family time. Problem was my team was spread across the globe and I was then working from 9pm to 12-1am so my screen time was significant. I wasn’t burning out, but came to the realisation that because of the working from home and the fact that timezones meant nothing I had to stop thinking as a 9-5 worker. This involved setting a routine that was achievable. When home I now get up, have breakfast with the family (when possible) and then get ready to go into the study. For me, having a shower first thing is still optional and while that might disgust some people out there, I tend to wash up during my first break of the day. That break is usually around 11am after dealing with emails and when the east coast of the US starts to go to bed. One of the things that I try and do during the middle part of the day is get out the backyard and shoot some hoops…basketball is a great game to play by yourself. Once I have lunch I usually get back on the computer for a couple of hours and then head out to the gym for a workout. Once I get back home the kids are back from school and generally its time for dinner and I try to do some family time where possible. After family time I then do the nightshift when most of EMEA is well into their day and the US is starting to wake up. From 9pm till 12am (or later) I can work efficiently and tend to get a lot fo work done during this period. It’s also when most of the timezones I deal with are awake at the same time, so interaction with workmates is at it’s peak. Those that know me know that I am a pretty social guy…I love a good chat and enjoy interacting with people in the office. Those that have worked with me, also know that I like to muck around a little bit and have a laugh during the day. All in all I enjoy peoples company, so probably the biggest adjustment to working from home was the fact that I did feel lonely to begin with. It was good to hear that people I have mentioned that to that also work from home had felt that as well…good in that I wasn’t alone in this. The key that i’ve found to combating that sense of isolation is to ensure that I am not home bound 24 hours a day, five days a week. The thing that solved this for me was developing a routine where I get out of the house to go to the gym to be around other humans…and while I am not exactly having conversations with people at the gym I’m at least physically around people which seemed to help. In addition to that, social media platforms like Slack, WhatsApp and Skype are critical social interactions and while they can be sometimes distracting…they are critical to making sure that I feel connected with the outside world which in turn helps beat the isolation. The last thing is around having a decent home office setup. I know a lot of people that work from home but work at the dinner table or on the kitchen bench. This isn’t conducive to being able to work constantly or efficiently. I made sure that there was a decent study when looking for a house and I’m lucky enough to have a good one at the moment. It’s isolated from the main living area of the house and setup in such a way that it closely replicates an proper office. Apart from all the right technology one of the biggest things for me is keeping this space tidy and organised. It’s important to maintain a high standard even though no one else gets to see the setup. Apart from that the other thing I’ve learnt is to make it as desirable as possible to be around…because I spend all day there I want to feel like I want to be there. Apart from the job being rewarding, for me it’s important to have a sense of pride in your work space so even if working from home it’s an important point to consider. One thing to finish up on is that support comes in many flavours while working from home. I’m lucky that I have a great boss and a great team that I work with…they help tremendously in making the working from home thing work. Without a great team and support structure it would be indeed be a lonely gig. All in all, after a period of adjustment I’ve settled into a decent routine while keeping myself sane during the periods when I am working from home. Ultimately what I learnt during the first twelve months of working from home is that you have to be disciplined. With the discipline to stick to my routines and get into a rhythm day in and day out it’s become easier and more natural. That said, I still miss the office atmosphere however there is some sacrifice that needs to be taken in order to work in a role that is ultimately very rewarding. And like actually being at an office…the key is to minimize distractions!